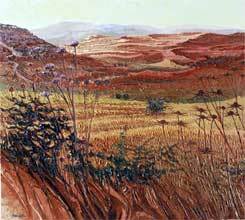 "I first went to Cyprus in late Autumn and found the landscape bleached and arid from the intense heat of summer, with nothing to inspire me. 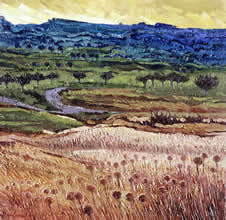 I returned in May and the landscape was simply overwhelming, vibrant with colour. 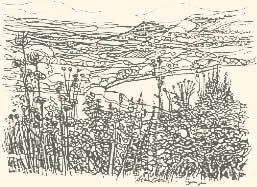 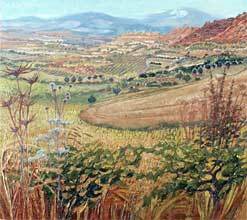 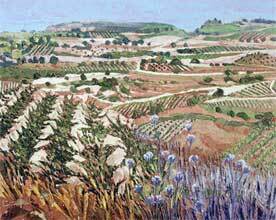 Everywhere there were crops, vines, olive trees and wonderful species of plants that I had never seen anywhere else." 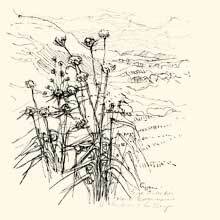 "In Cyprus, particularly on the on the slopes of the Troodos, the ground is harder to cultivate than in Provence or Tuscany and the hillsides have been sculpted to create terraces on which to grow vines and olives. 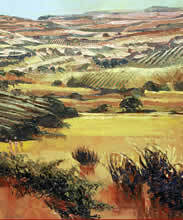 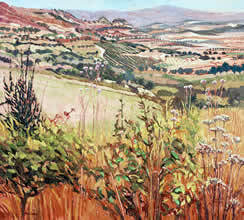 Perhaps more than anywhere, the Cyprus landscape offered me the opportunity to use vast swashes of colour against which the foreground plants of bewildering variety, create tremendous spacial depth in my paintings"